In the first installment of his Icelandic adventure, we followed Field Notes contributor Larry Mishkar and his hiking partner Jenni Post as they hiked toward the Eyjafjallajokull volcano. They spent seven weeks in Iceland last summer testing their physical and emotional endurance against the country’s ashy trails and scree-covered switch-backs. In this installment, their second day of hiking takes them through deep ash and over new lava from the Eyjafjallajokull volcano. We awake to clear weather (meaning no fog) after a good nights’ rest at the Baldvinsskáli hut. Yellow trail markers outline the zig and zag trail crossing the ash-covered snow, and the Fimmvörðuháls hut is still visible. It’s one of the many huts across Iceland owned by Útivist, an Icelandic hiking association. It’s hard to judge distance here, but after an hour of grueling switchbacks, we’ll get to see the hut first hand. Beyond the hut, we’ll be hiking through Goðaland on the way to Thórsmörk. Upon reaching the hut, we hear voices coming from inside, and see a bright yellow unicycle stored under the eaves. 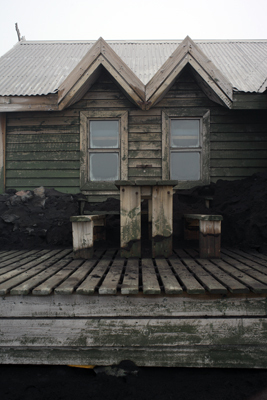 Dark lines on the hut’s walls tell the story of a thick blanket of ash, up to a meter in depth that had covered the deck. Someone did a lot of shoveling! Quietly, a man appears at the door and identifies himself as the hut keeper. He welcomes us. Inside we find warmth supplied by a heater and eight bodies who’ve spent the night curled up in the bunks. 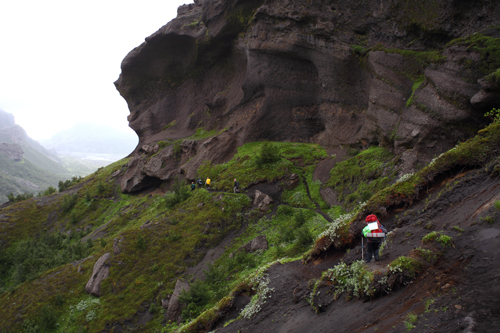 As luck would have it, a Útivist guide named Ása and her family are about to leave the hut for Básar, another Útivist hut at Thórsmörk. A new trail, marked the day before by another Útivist guide, detours around most of the new lava flow, and we’re invited to hike with them. As we set off, fog rolls in, but the yellow trail markers keep us on course—it’s still hard to stay on the path. Our group comes to a ‘Y’ in the trail; to the right the original trail goes a short distance, ending at a 20’ wall of new lava. The new trail, with fresh markers and no deep rut cut from boots, veers left. So do we. After a brisk uphill hike, we come to a stop on a ridge. Below us, the landscape looks like the moon. Above us, somewhere up in the clouds, is Eyjafjallajokull. 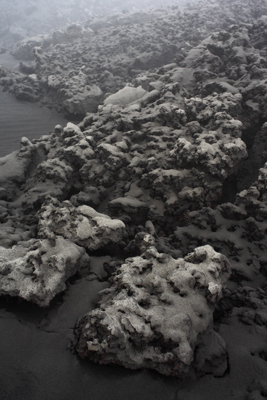 Evidence of the eruption is all around us: ash, small steam vents, burned rock, hot lava, and the stench of sulfur. There is sound too, the sound of super heated steam bursting through the earth’s surface through tiny holes in the crusty surface. Our hiking speed slows as we linger to observe the eerie landscape and take photographs. We stop along side of the new lava flow. The air is damp and mist accumulates on the surface of our clothes. Even with a thick mix of fog and clouds, we get some sense of the landscape. Vents shoot up steam from cracks in the earth. Rock, turned brilliantly wild colors by the heat, crunch under foot. They’re sharp, brittle, and still hot. Hot air radiates from the earth and sulphur smells twist our noses. We stop for a while and build a small cairn with loose lava rock to mark the trail between yellow markers. After traversing the interior of Magni, the larger of the two new craters that erupted back in March, we carefully cross over a short distance of fresh lava. (The newly staked route takes in two new craters, Magni, and the smaller Móði, named after the sons of the Norse thunder god Thor). Stepping lightly, the new lava appears like whipped chocolate frosting, with brittle tips, sharp points and edges, and smooth surfaces. We move quickly; there’s no time for photography. If we rest too long, we might break through the crust, and suffer severe, if not deadly, burns. We cross without incident, then stop and take photographs. Despite all the ash, one small flower manages to grow near the lava flow. Its deep pink color contrasts greatly to the black ash. We stop to admire its success. The trail continues up a step ridge, then immediately down the other side, equally steep and treacherous. We rejoin the original trail here, and pass a rock cairn marking where two women and a man died in a 1970 sleet storm. With the aid of a steel cable, we lower ourselves down a steep ridge traverse, shielding ourselves among boulders to have lunch in the saddle of two ridges. Then the rain begins. For an hour, it rains horizontally as we continue our hike across a rocky plateau. Small rocks outline the trail, guiding us slowly down another ridge. Gradually, we begin to see more green. Thórsmörk is close by. As we dip below the clouds, we see dwarf birches, green grasses, and millions of flowers in bloom along the hillsides and peaks. Guided by ropes strung between high points, we step carefully as the trail follows the ridge’s razor’s edge. Flowers and shrubs perfume the air. The sweet aromatic smell is almost overwhelming. Many plants are quite small, in various colors, shapes and sizes. We also notice the Heath spotted orchid (Gevlekte orchis), huddled close to the ground. We’ve arrived at Thórsmörk. Our Iceland companions quicken their pace and disappear down the trail. We stop and make numerous photographs. Having witnessed so many landscape and weather patterns in just 48 hours, we wonder: what’s next? We follow the signs to the Útivist campground. Amongst the birches are open areas for tent camping. Lush green grass rooted in thick ash is a reminder of what occurred here just a few months before. After dinner, we chill out and enjoy the view. Large rock outcrops surround us. The Krossá River, the drainage for the giant Mýrdalsjökull Glacier rush nearby; its wide expanse will require skill to cross tomorrow as we continue northward. As the evening settles, the clouds begin to clear and shafts of yellow light paint the surrounding rock walls from blue to yellow, orange, and red. The young leaves on the birches are bright green in this light, their edges outlined in bright yellow. Another night of sore feet, full bellies, and a sense of ‘wow’ overcome us. Tomorrow will be another day of adventure. So cute we can't stand it!